South Korea’s foreign minister said Thursday that US officials told Seoul that it was North Korea that canceled nuclear talks this week between US Secretary of State Mike Pompeo and a senior North Korean official. Foreign minister Kang Kyung-wha provided no reason, aside from “busy schedules,” for why North Korea canceled the meeting set for Thursday in New York that was meant to discuss ridding the North of its nuclear weapons and setting up a second summit between US President Donald Trump and North Korean leader Kim Jong Un. But some analysts say a last-minute cancellation a familiar North Korean tactic could be aimed at pressuring the United States to agree to a quick Trump-Kim summit because the North thinks it can win major concessions from Trump that lower-level US officials might try to block. The US president has recently appeared to be slowing the pace of diplomacy with North Korea amid signs that Kim is lagging behind in his supposed promise to denuclearise. Before this week’s cancellation, Trump said he wouldn’t play a “time game” with the North over a denuclearisation deal, while his national security director, John Bolton, said a second Kim-Trump summit won’t happen until 2019. But North Korea has since insisted that US-led sanctions against it should be lifted before there will be any progress in nuclear negotiations. This has fueled doubts about whether Kim will ever deal away a nuclear programme he may see as his strongest guarantee of survival. Washington says the sanctions will remain until North Korea takes concrete steps toward irreversibly and verifiably relinquishing its nuclear weapons. Many officials in the US administration want to take time in setting up a summit because they’re trying to get something more substantial after widespread criticism that Trump made large concessions to Kim in the first summit without getting much in return, said Park Hyeong-jung, an analyst from the Korea Institute for National Unification in Seoul. This would require that the US and North Korea hammer out details in lower-level talks about what can be exchanged at the next summit, but the cancellation of the meeting between Pompeo and Kim Yong Chol indicates that the two sides remain far apart, Park said. Critics say Trump’s decision to start off his North Korean diplomacy with a leaders’ summit, instead of building upward from lower-level talks, bestowed legitimacy on the North before it took any meaningful steps toward denuclearisation. After his June meeting with Kim, Trump raised security jitters in Seoul by abruptly canceling major US military exercises with South Korea which North Korea had termed invasion rehearsals. 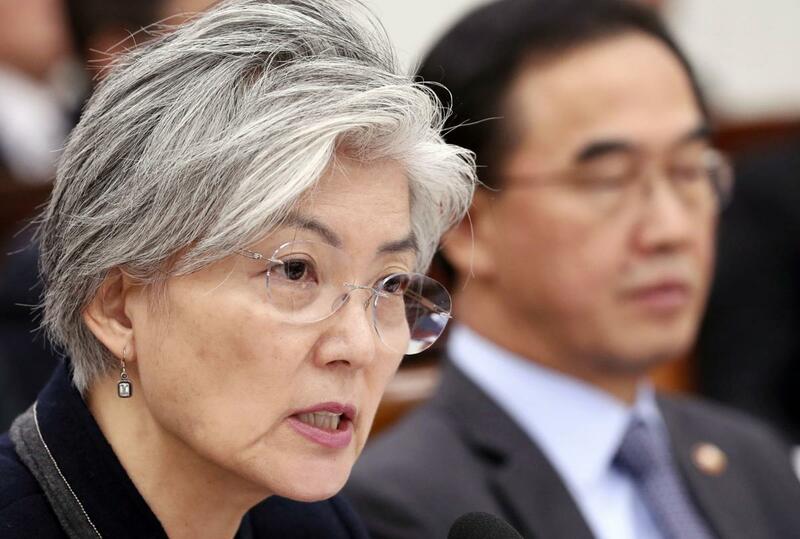 Foreign minister Kang told lawmakers she planned to discuss the matter with Pompeo over the phone. South Korea’s presidential office earlier said that the meeting’s postponement wouldn’t affect the momentum of talks between the US and North Korea. US State Department spokesman Robert Palladino said the postponement was “purely a scheduling issue” but refused to elaborate. He did not provide a straightforward answer when asked whether the discord over sanctions has made it more difficult to set up meetings. Seoul has worked hard to revive nuclear diplomacy between the US and North Korea that has reduced war fears among South Koreans following a provocative run in North Korean weapons tests and Trump’s threats of military action last year. Kim Jong Un shifted to diplomacy early this year and has held three summits with South Korean President Moon Jae-in. North Korea’s Foreign Ministry last week criticised the United States for its continued support of sanctions and hinted it may resume nuclear development if the measures aren’t lifted.